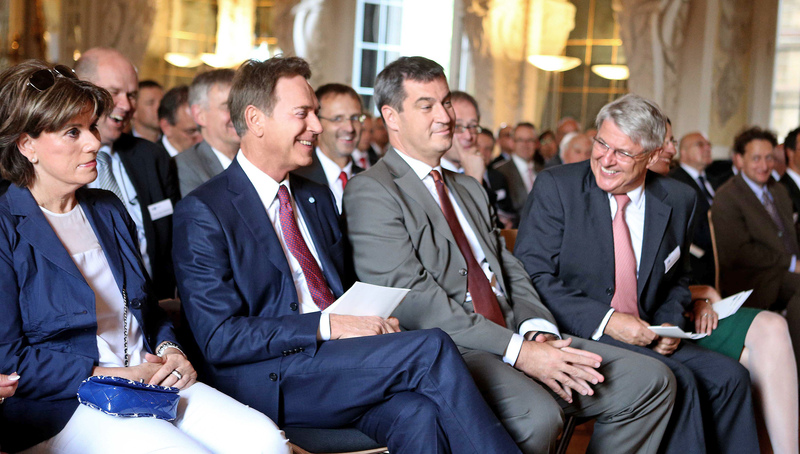 At the award ceremony for the “Golden Pin of Honor” (“Goldene Ehrennadel”) at the Coburg Chamber of Commerce (IHK) in Ehrenburg Palace’s historic Great Hall: Michael Stoschek, Chairman of the Brose Group with his wife Gabriele, Bavaria’s State Minister of Finance, Regional Development and Regional Identity Markus Söder (2nd from left) and Rolf-Peter Hoenen, former CEO of the HUK Coburg insurance company (left). Michael Stoschek, Chairman of the Brose Group, received the “Golden Pin of Honor” from the Coburg Chamber of Commerce for his service and contributions to the regional economy and public welfare. The former CEO of the HUK Coburg insurance company, Rolf-Peter Hoenen, was also honored with the highest award presented by the chamber. The ceremony took place in Ehrenburg Palace’s Great Hall in Coburg on Wednesday afternoon. Among the roughly 150 distinguished guests were numerous state and local politicians as well as important representatives from business, science and society. Prince Andreas and Prince Hubertus of Saxe-Coburg and Gotha also took part in the ceremony. family-owned company at the young age of 23 and developed it into an internationally successful automotive supplier in 34 years. “Making a company strong is one thing. Keeping it strong is the real economic challenge. For Michael Stoschek, entrepreneurship means also taking on responsibility outside of the company,” said Söder. He underscored his many years of service in the General Assembly of the Coburg Chamber of Commerce and his presidency from January 2007 to June 2008. The Bavarian State Minister also mentioned Michael Stoschek’s numerous awards such as the Grand Cross 1st Class of the Federal Republic of Germany, the Bavarian Order of Merit and recognition for running a family-owned company. Söder praised his great commitment to social issues and sports, and even highlighted the honoree’s achievements in show jumping and as a rally driver. “An impressive vita, a strong, strong personality, a great entrepreneur,” Söder summarized. This is the seventh time the Coburg Chamber of Commerce has awarded the Golden Pin of Honor. In his speech, Chamber President Friedrich Herdan talked about the far-reaching impact both of the two new honorees have had: “Brose and HUK are heavyweights in our economic area and prominently stand for prosperity in our Coburg region, have significantly influenced our district chamber and have a global reputation that goes well beyond our national borders with their product spectrum. This is an outstanding entrepreneurial achievement, one that deserves the highest recognition,” said Herdan. Michael Stoschek showed his appreciation for receiving the award, which he also sees as recognition for his grandfather Max Brose. He also thanked his wife, Gabriele, for her great support and being at his side through the years in all the different tasks.